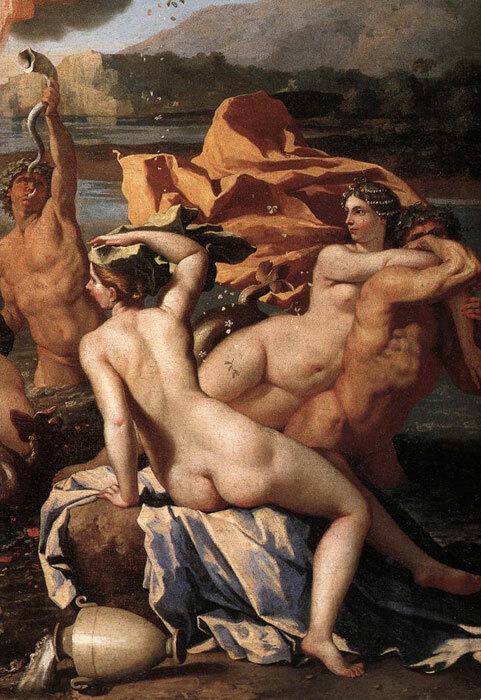 The lightness of tone is seen in the Triumph of Neptune by poussin in the Philadelphia Museum of Art, a picture almost certainly painted for Richelieu and probably rather earlier than the three large Bacchanals for the château. The composition of the Triumph of Neptune is derived from Raphael's fresco in the Villa Farnese, but the result is unfortunately a little pedantic; when looking too closely at other art, Poussin forgot to relax and somehow stopped letting his own special intensity dominate. The result is light-hearted and decorative, and its subject has been interpreted in many different ways. The mythological story depicted in The Triumph of Neptune is the following. Amphitrite fled from Neptune's wooing, but he sent dolphins after her which succeeded in persuading her to return to become his bride. She rides beside his chariot on a dolphin's back, an arch of drapery billows over her head, a common feature of sea-goddesses from antiquity. They are surrounded by a retinue of Tritons (the name for mermen in general) and Nereids (sea-nymphs, the daughters of Nereus, the 'old man of the sea' in Greek mythology). The Triumph of Neptune by Poussin was probably painted for Cardinal Richelieu. It has been subject to widely differing interpretations. SPECIAL NOTE : The painter will make the reproduction as close to the original oil painting as possible. If you want your painting to alter from this likeness, please email us and " The Triumph of Neptune , 1634 " will be reproduced according to your special requirements.